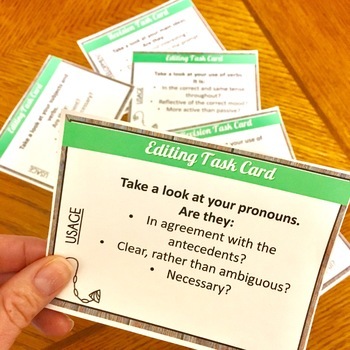 These revising and editing task cards are perfect for any mode of writing to help you help your students work through the process of putting on the finishing touches to their essays. 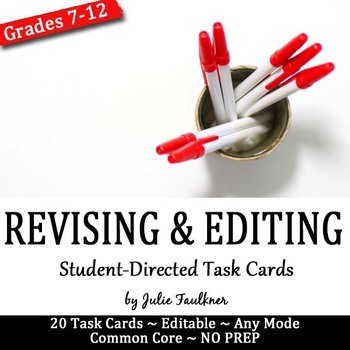 I truly believe in being proactive during the writing process to teach students how to actively engage with revising and editing, so they don’t make it all the way through the essay – and submit – before it’s too late. Plus, allowing time to revise and edit before the deadline day can make your job of grading so much easier, too! 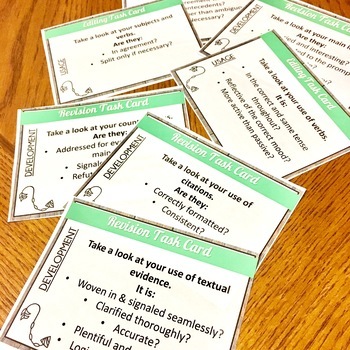 Additionally, these task cards are written so that they can easily be used by the students for peer editing. 20 cards are included, and they are 100% editable! You can have these ready and pull them out a moment's notice to conduct an amazingly in-depth lesson. Your students will love that they are interactive. You will love that your students are thinking critically and meeting standards. Your admin will love that students are engaged and that you've differentiated your lesson! See more ready-to-go writing resources!